Pinterest. What is it you ask? Well, it’s a virtual bulletin board where you can find interesting pictures and articles and “pin them” for later. It’s essentially virtual hoarding, but not just hoarding of stuff, but also craft ideas, photography, tattoos, cool houses and much, much more. 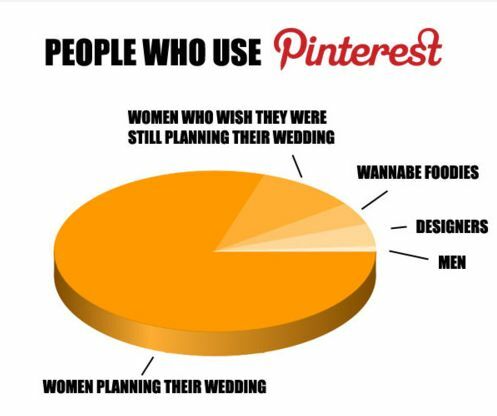 Some people seem to think Pinterest is limited to women who are focused on one thing. I’m pretty sure this only shows the men who are openly on Pinterest, ’cause John pinterests from my account all the time. I was recently listening to a stand-up routine by British comedian Robert Newman, who in the course of an Iraq War joke stated something I thought was pretty dang profound. You hear that, starving kids in Sudan? Who are these people? Well, the the “body positive” movement is the result of a reaction against the air-brushed, Photoshopped, and ultimately anorexic presentation of beauty offered by mainstream culture. It’s given us Dove’s “True Beauty Campaign” in which “real” women were used as models (hoping you’ll forget that the same people who run Dove run Axe). And it’s given us a host of philosophical epitaphs on how the size of your brain or heart are vastly more important than the size of your waistline. And it all has a certain logic to it. Forget society’s standards! Be comfortable with who you are! Your insides are all that should count! Reject anorexic beauty standards! Enough making yourself sick trying to pursue unrealistic and unattainable goals! Only you can make you feel inferior! Now I know that it must sound pretty weird that these people would wind up being the subject of a Shame Day. After all, what’s wrong with rejecting the media’s unattainable and anorexic standard of beauty and embracing your body for what it is? Sure, I could say this guy is “husky” or “bigger” or “shaped differently” or use any other paper-thin euphemism for fat. Doesn’t change a thing. I could name the asteroid about the hit the earth Friendly Ed and there’d still be as much devastation when Edward hits New York. We can call it anything we want- we’re still not changing the fact that being fat isn’t any more healthy than being stick-thin. And no, not all of them are- but enough of the big players are endorsing pretty much this philosophy. Let me offer this post from The Body Positive’s website as an example. In her article “‘Tis the Season to be Squishy”, Connie Sobczak asserts that there’s really nothing wrong with gaining weight during winter months, as this is simply the body’s natural reaction the cold as a result of evolutionary adaption. And that is true- only Sobczak goes on to use that factual statement to prop up some far more dubious claims. What Sobczak is doing here is attempting to twist evolutionary biology into an excuse for lack of self-control. There’s nothing wrong with wanting to eat a bag of chips. There’s nothing wrong with wanting to eat a bag of chips in winter when you need more calories. There’s nothing wrong with stating that as your reason for eating more chips. But taking all of that and coming away with the conclusion that eating chips (or anything else) is retroactively sanctioned by biology and stating that this conclusion is supported by medical professionals is as dishonest as it is deluded. Look, it’s true that who you are on the inside is vastly more important than who you are on the outside, no one is going to argue that. But let’s talk about excess, people. Let’s talk about gluttony. Aren’t these realities? Let’s compare the number of people who have had become ill or died as a result of being overweight and contrast it to the number who have become ill or died as a result of being underweight in this country. Which side is gonna have claimed more? Now that ain’t an endorsement of anorexia or our twisted standards by any means, it’s simply a counter-point. But hey- maybe it’s not a health thing. Maybe it’s just about being comfortable with who you are regardless of your size. That’s the line taken up by comedian Gabriel Iglesias in his stand-up routine. Towards the end of one of his acts he states that he wouldn’t want to live to be a hundred if it means he couldn’t eat cake. He asserts that working out doesn’t ensure you’ll live long- why not enjoy life while you have it? So if that’s the case, why are we jumping on the bulimic and anorexic members of society in the fist place? Hey- if health isn’t an issue and happiness is, why is a a girl weighing less than seventy five pounds any worse than a girl weighing three hundred? Why is it “Body Positive” for a woman to expand her waistline and self-loathing when she expands her bust line? It just doesn’t pan out. Look, I’m not here to offer any solutions. I’m six feet tall (when I’m not slouching, which is always) and skinny. I smoke a little bit, drink a little more, and could stand to cut down on the meat and up my intake of fruits and vegetables considerably. I don’t work out, but then again, if wolves were to be introduced to my city, I’d probably be ok. Despite my extreme examples, the vast majority of us are neither morbidly obese or carried off by strong winds. All that’s to say that I’m in no place to pass judgment on anyone, nor is it my intention to do so. I’m simply here to point out the hypocritical and seemingly self-serving logic being employed by the group in question. Body Positive, shame on you.